The inside out philosophy is a way of approaching the health, management and training of the horse in a way that addresses the source as opposed to surface appearances. The hoof is a structure that is continually regenerating itself from the inside out. The form of the hoof wall is a product of the living tissues (laminae) inside the hoof which generate it. Hence the fact that, for example, damage to the laminae results in rings and flaring of the hoof wall. We humans have a tendency to focus on outer appearances instead of looking for the deeper functioning of things. This is why, in terms of hoof trimming, many methods put a lot of emphasis on making the hoof look right from the outside, instead of sticking to the measures that will help the hoof to become more healthy from the inside. An example of this is rasping off flaring of the hoof wall, so that significant amounts of horn are removed right up the outside of the hoof wall, in order to make the hoof look as though it has grown down nice and straight from the coronet to the ground (see photo, right). 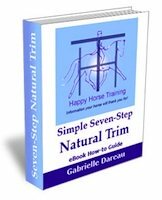 Not only does this thin and weaken the important weight-bearing hoof wall, but it does nothing to remedy the source of the problem, if anything aggravating it by making the hoof more sensitive. If we address the real issues we can ensure that the hoof wall grows down straight and strong itself, as a reflection of the healthy structures within (photo, left). Like most problems when we want to address them at source, the solutions are multifaceted. 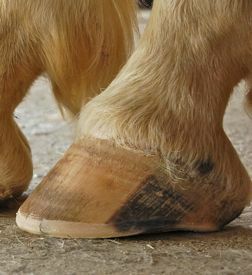 It's not just about adopting the right trimming technique (although this too is essential) but also addressing the horse's diet, lifestyle and management, so that they promote healthy hooves. When it comes to hoof trimming itself, all we need to do is keep the important part right. That comes down to the height and shape of the hoof wall where it contacts the ground, and the balance of the heel height in relation to the internal structures of the hoof. Then if we are patient enough to wait and see what happens as we keep these basic things right, we will see how amazingly the hoof can transform from the inside out. If we impose a rigid idea of what is right on the hoof from the outside, we never allow the space for healing to occur. 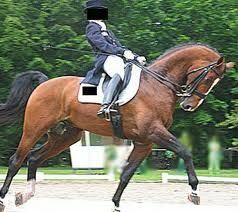 The human tendency to fixate on outer appearances comes into its own in riding, especially in a discipline such as dressage, which is judged solely on this basis. When we start to think only about what the horse looks like when we are riding, we start trying to impose a certain appearance on the horse, forgetting that, in riding, outer beauty comes from inner straightness, suppleness and strength - the qualities developed by correct engagement. 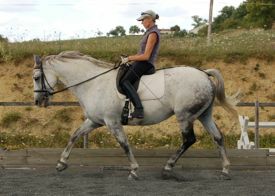 For example, many dressage riders believe that they need to determine, through the rein contact, the positioning of the horse's head carriage to correspond with the level of training - e.g. whether it is low and round, or high and 'advanced'. This is a fundamental misunderstanding, taken to its extreme in abusive training methods such as rollkur (photo, right). The head-carriage that a horse gives to the rider is a direct result of the degree of gymnastic development of the horse's ring of engagement, as well as being a function of his conformation. The rider therefore must not position the horse's head independently with the reins, but only seek to strengthen the engagement of his whole body, which in turn gradually develops his neck into the sought-after advanced shape. This mare (photo, left) worked for several years with a very low neck due to a weak back and other conformational issues. With gradual strengthening from working in engagement, she has now come up onto a correct higher head-carriage, without any 'help' from the rein contact. Note her correct diagonals (see What does 'on the bit' really mean? for explanation) and longitudinal stretching towards the bit. 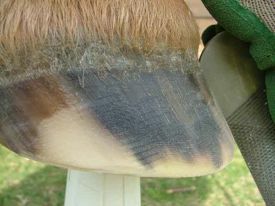 In the same way as for hoof trimming, riding well is about keeping certain crucial things right in your technique (i.e. 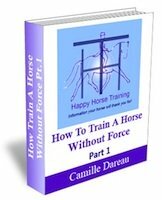 your interaction with the horse through your seat position, weight, and straightness) and then being patient enough to allow the connection to grow between you and the horse through correct engagement. If we forget the good feeling that is inherent to all good work, and start to think about making things look pretty, forcing a predetermined shape onto the horse, then we will quickly lose our way. 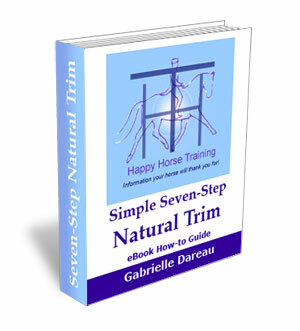 For any horse-owner who wants to acquire the priceless skill of barefoot hoof trimming, or to adapt their current technique to the simple yet sophisticated natural trim, this comprehensive guide provides clear, step-by-step instructions, fully illustrated and with all the extra information you need on tools, handling, and good barefoot management. Also new on HHT: The Happy Horse Blog which updates you with anything new on the site, as well as regular insights which we post as they come up in our work with horses. You can receive all of these updates on your RSS reader by subscribing via the HHT site.